On Monday evening, a handful of heavily armed white men arrived in Ferguson, Missouri, unsettling protesters and confusing some police. However, the group, who call themselves the Oath Keepers, surprised the local community when they started passing out flyers for a yoga class later that night. Thousands of protesters and police alike participated in 90 minutes of restorative movement, breathing, and meditation. 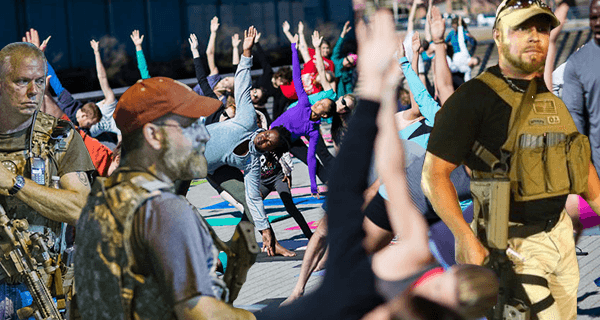 “Wow, yoga really does help everything,” exclaimed one officer. A nearby protester enthusiastically concurred, asking the cop if he was planning on going to the midnight Anusara class. They agreed to go grab an iced tea afterwards. However, the Oath Keepers’ informal uniform of guns and bulletproof vests has caused some protesters to question their intentions, but the group of gun-wielding Caucasian men maintain that their militaristic adornments are beside the point.